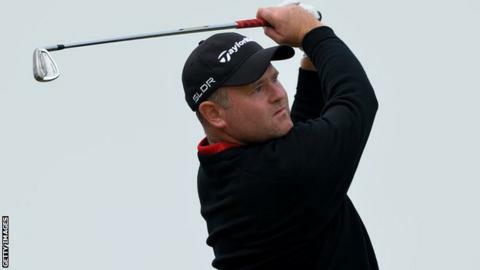 Alastair Forsyth's caddie has died of a heart attack during the final day of the Madeira Open. A statement on the European Tour website confirmed Zimbabwean Iain McGregor had passed away despite the efforts of medical personnel. "Everyone at the European Tour extends our deepest sympathies to the friends and family of Iain at this time," the organisation said. RIP Big Mac. You will be missed. My condolences. After play resumed, Daniel Brooks won by beating Scott Henry in a play-off. "Following consultation with the players and caddies involved, it has been decided that play should continue and the tournament should finish," added the European Tour in their statement. "A minute's silence has taken place at the clubhouse and play resumed at 18:00 local time. "All administration will be taken care of by the European Tour and we will help in any way possible." McGregor suffered a heart attack at the ninth hole at Santo da Serra. Nine-time major winner Gary Player was among those to pay tribute to McGregor on Twitter, saying: "RIP Big Mac. You will be missed. My condolences." Zimbabwean golfer Tony Johnstone said in a tweet: "A top man and will miss him." Forsyth's fellow Scot Paul Lawrie added on the social network that McGregor was a "great guy". The tournament had been reduced to 36 holes due to numerous lengthy delays caused by fog. Henry was the clubhouse leader going into the final round and birdied the last three holes to force the play-off. However, the Scot three-putted the first extra hole, the 18th, and Englishman Brooks secured the title with a par.